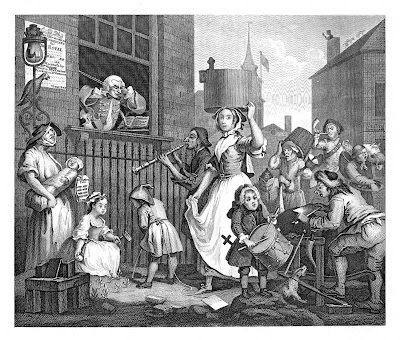 The Enraged Musician and The Distressed Poet are two prints by English painter, satirist and cartoonist William Hogarth. The Enraged Musician is actually the older of the two. It was completed in 1740 and the following year, its companion piece, The Distressed Poet was finished too. The two prints were issued together that year, in November. There was also supposed to be a third image on the subject of painting, but Hogarth never completed it. Let's take a look at the finished plates, shall we? As always, click on the pictures to enlarge them. Then wrote and flounder'd on, in mere despair." 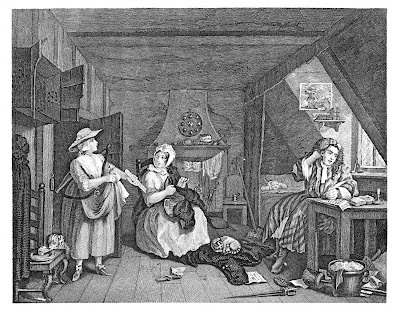 Life for a poet without a patron wasn't easy, as this print shows us. The poet, who is wearing an old nightgown and no shirt, is seated on his bed, scratching his head to look for inspiration for the poem he is writing about riches. A subject he doesn't seem to know much about, considering the poor life he leads. He lives in a poorly furnished, not well-kept garret. The floor is uneven, one of the windows is broken, the plastic is coming off the walls and the cupboard is empty. On the table lies a copy of Edward Bysshe's The Art of English Poetry, a guide to composition published in 1702, while a copy of Popes's satirical Grub Street Journal is abandoned on the floor. Next to him, his wife is sitting down in a chair, mending her husband's clothes. Suddenly, an angry milkwoman bursts into the room, demanding in a loud voice, to be paid. The noise awakens the baby, who was sleeping peacefully in the bed. While no one's looking, a dog steals what's left of the mutton carelessly left upon a chair. While his wife is paying attention to the milkwoman, the poet is still absorbed by his poem, a fact that underlines how he prefers to follow his dreams of glory than getting a proper job so that he can provide for his family. This idea is farther emphasized by the map of the gold mines of Peru that hangs over his head, which replaced the image of Pope that appeared in the earlier sketches of the print. While he doesn't seem to be bothered about his wife and kid going hungry, the poet still finds the money to enjoy his pleasures: a pipe and tobacco are on the window sill, a mug of beer is sitting on a chair, his wing and sword lay at his feet, while his lace cuffs are drying by the fire. His fiddle throws aside,—and stops his ears." Unlike the poet, the musician doesn't have money worries. His talents have attracted the patronage of nobles. The scene takes place in the chamber of one of these nobles. The musician, wearing a rich and sumptuous coat, is about to start a music lesson when some noises distract him. He opens the windows to see what's happening but the noise is now so deafening that he has to stop his ears. 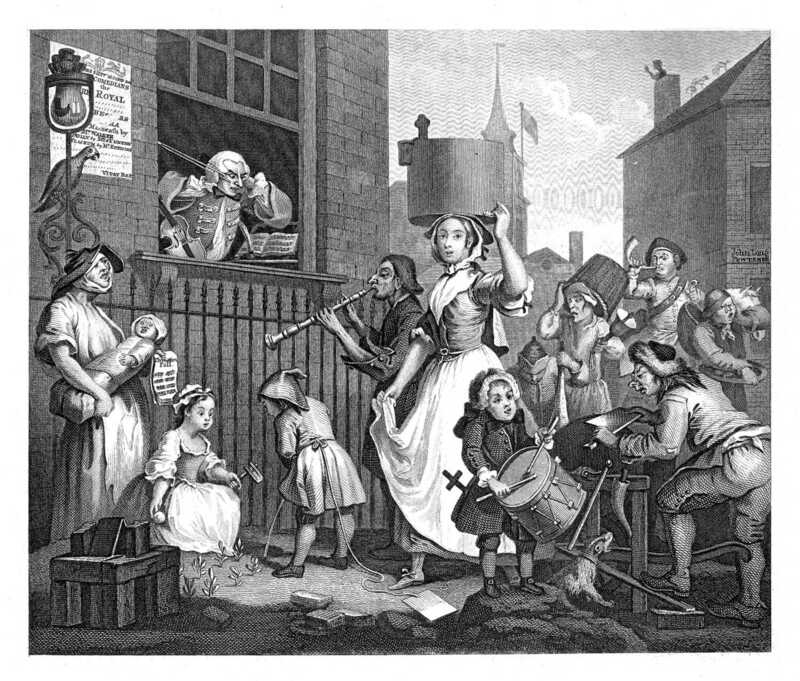 Street musicians are playing in the street, a milkmaid is shouting to attract customers, an infant is crying, a pedestrian cutler is grinding his butcher's cleaver, and even a parrot and two cats are adding their voices to the mayhem! The plate, which well-describes the cacophony of sounds heard all over London was inspired by Mr John Festin, a music teacher very popular in London. "At nine o'clock in the morning," said he, "I once waited upon my lord Spencer, but his lordship being out of town, from him I went to Mr. V——n. It was so early that he was not arisen. I went into his chamber, and, opening a shutter, sat down in the window-seat. Before the rails was a fellow playing upon the hautboy. A man with a barrow full of onions offered the piper an onion if he would play him a tune. That ended, he offered a second onion for a second tune; the same for a third, and was going on: but this was too much; I could not bear it; it angered my very soul—'Zounds!' said I, 'stop here! This fellow is ridiculing my profession; he is playing on the hautboy for onions!'"